One important way to change an individual’s cognitive workload is through training. The figure below is an idealized view of the impact of training. Here, the lighter lines repeat the graph performance and workload before training. The bolded lines show the expected outcome after an individual receives training. 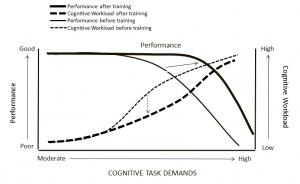 Training should have a significant impact on both performance and cognitive workload. After training, the individual should be performing at a higher level than before training. And as task demands increase, high performance should be maintained longer. This shift in performance is illustrated by the solid arrow in the figure. At the same time, training should lower the cognitive workload of the individual as he gains familiarity with the required tasks and becomes more competent in executing them. This reduction can be seen in the lowering of the dotted line, as shown by the dotted arrow. To summarize: performance is dependent upon the individual’s cognitive workload as well as upon the task’s cognitive demands. To improve performance, we can either attempt to modify the individual’s workload—perhaps through training—or to modulate the task demands—perhaps by simplifying the task in some way.